By popular demand, Display Overstock is proud to present the Tru-Fit MAX Media Kit add-on! 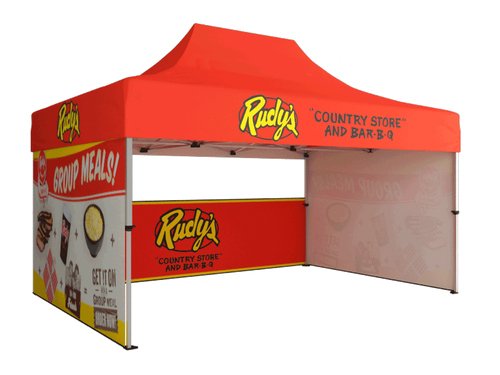 This stunning, lightweight media add-on brings a new dimension to our Tru-Fit line of trade show displays*. Stop wasting money renting TV stands at trade shows or trying to ship the old school, heavy monitor stands around. Fitting into a single case for easy transport, the Tru-Fit media kit is the best solution in the industry for your trade show booth's media needs. Not only does this incredible trade show kit have a monitor mount for a TV up to 40", but it also boasts an attention-grabbing custom printed header for extra brand marketing. Let's not forget the two product shelves that attach to display key products during your event or trade show. The Tru-Fit MAX add-on is designed to be used in conjunction with our 8' Tru-Fit Curved/Straight, 10' Tru-Fit Curved/Straight, and 20' Tru-Fit Curved/Straight/Serpentine displays. Make sure you have one of these breathtaking backdrops to accompany your new Tru-Fit Media Kit add-on!